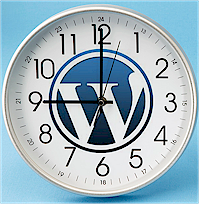 Telling your WordPress site the correct time is very important. It affects when your scheduled posts publish, which could impact when your RSS service picks them up. The site time also determines when the regular maintenance duties happen, like your site backup and emails being sent out. By default, WordPress uses a Cron job to calculate time. And, there are two ways to set the time in WordPress, and the Cron job may not recognize one of them, and daylight saving time may not recognize the other. Discover the best way to set this important feature of your site properly. It’s short for crontab, which is a file that tells Linux based systems when to run scheduled jobs. Your website is on a host that runs a Linux based system. You can edit the file. But, you shouldn’t unless you have a reason to and you know what you’re doing. All you’ll be doing here is telling WordPress your local time from within your admin area so the Cron job will know when to do things. So, no scary, techie stuff. To tell your site what time it is, from the Dashboard, go to Settings > General. Scroll down a bit and you will see a drop-down for selecting the time. You can either choose a city in your time zone or use UTC (Universal Time Code). More on which one to choose is below. Once you select the time, scroll down to the bottom and click the Save button. Check your local time (it will be in military time). The internal WordPress Cron job runs on UTC. So, it would seem to be the best choice. However, UTC does not follow or recognize Daylight Saving Time. So, for a few months out of the year, your site timing is likely to be off by an hour, depending on where you live. If you choose to base your time on a city in your time zone, Daylight Saving Time will be recognized whether or not your immediate area participates in it. For example, Arizona does not participate, but every other state in Mountain Time does. And, different parts of Europe roll into DST on different dates than the U.S. So, publication of your scheduled posts could arrive to them earlier or later than usual. You may think this is a little problem. But, it’s actually a big problem for plugin developers who use external APIs to make their plugins work. In fact, any developer who has to work with Facebook’s API pulls their hair out because it runs on California time while every other default WordPress element runs on UTC. The only time this issue is likely to cause you a problem is if you have your scheduled post publish time too close to the time set for your RSS pickup. For example, I usually set my posts to publish just after midnight in my local time zone, which is Central Time. I set MailChimp to pick up the RSS feed at 4:00 am in my local time zone. If I set the post to publish just after midnight and then set the RSS to pickup at 1:00 am, the post could actually come out too late during Daylight Saving Time. One other site chore that could be affected is the sending of email notifications. While you can run a newsletter or other bulk emails out of your site directly, most folks don’t. But, folks who run membership sites do send notices directly from them for regular maintenance, such as renewal notifications for subscriptions, or requests to change passwords. Being an hour off with those notices won’t burn down the house either. Email notifications also get sent to you when anyone leaves a comment on your site, if you have it set to do so. It’s not likely that the time you set will affect that, though. So, whether you use your city or UTC for setting your time on your site is not as important as being mindful of what else it must coordinate with outside of your site, like your RSS feed pick up. Personally, I use UTC to stay in lock step with the Cron job.